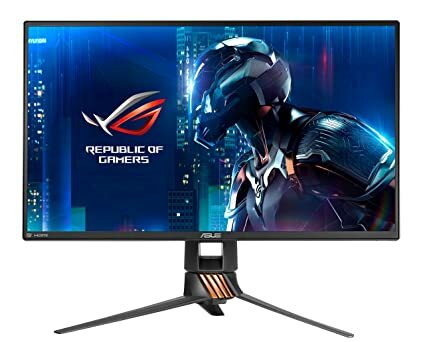 Of you thought 144Hz was a high refresh rate then the Asus ROC Swift PG258Q points and laughs at you – its brand-new 25in 1080p TN LCD panel can refresh at a superfast rate of 240Hz. While we’ve seen 16SHz and even 180Hz monitors before, this jump is the first real step-change since the industry settled on 144 Hz being the standard for gaming displays. Of course, the key question is whether moving to 240Hz will have the same benefit as moving from 60Hz to 144Hz, or if it’s a case of diminishing returns. But let’s start by running through everything else this display has to offer. For a start it packs in loads of features. It supports Nvidia G-Sync and Ultra Low Motion Blur (ULMB) technology, plus it has a slim and low-profile bezel, a fully adjustable stand and even a few USB ports. What’s more, it mostly looks and feels great, with its metal stand and circuit board design on the rear. The copper highlights won’t suit all tastes, but it generally looks great The one exception, to our tastes, is the down firing, red tight in the stand, which can project the ROC logo, or design of your choice, onto the desk below. It isn’t subtle and can be distracting – we turned it off. Another design step too far is the cover that clips in place over the power, video and USB ports to make for a tidy look. It looks good, but it’s inconvenient when you want to use the USB ports. What’s more, the selection of connections is modest. You get just one DisplayPort socket one HDMI and two USB 3 ports, plus a headphone jack. You also miss out on speakers, but that won’t bean issue for everyone. Setup, though, couldn’t be easier. The fully adjustable stand and excellent OSD makes the whole process a breeze. The mini-joystick controls on the back of the display for navigating the OSD are the best in the business. You also get several useful options in the OSD, including a mass of game centric presets, a Dark Boost setting for making the dark areas in games more visible, an overdrive option and, of course, the ULMB mode. The latter is a backlight-strobing blur-reduction setting, which works very well at up to 144Hz, although it can’t be used in conjunction with G-Sync or at a 240Hz refresh rate. otherwise it does a decent job. What’s more, quality doesn’t drop much as you increase the refresh rate. Then we come to gaming where, rather surprisingly, that 240Hz refresh rate does make a difference. You’ll need to be in the upper echelons of competitive gaming to really benefit and even then, the difference to your final score might be minimal, but it certainly makes games feel snappier, as long as your CPU can output the frames. As for choosing between 144Hz with ULMB blur reduction or 240Hz without the jury’s still out. The former does look clearer, but the latter feels more responsive, so it depends on the game you’re playing. What we can say. though, is that overall, the PG258Q is a fantastic gaming monitor. It’s just a shame if s so expensive. Alternatives with FreeSync instead of C-Sync are cheaper, and even they’re rather pricey for what still amounts to a 1080p, TN monitor. The Asus ROC Swift PG258Q is a superb gaming monitor. Its240Hz panel is class-leading for fast-paced games and image quality is decent too. However, there’s no getting around the fact for a 1080p TN gaming monitor struggles to feet like good value for money. Class-leading gaming performance, but far too expensive for a 1080p TN monitor.